As long as you are not afraid of narrow enclosed staircases you have to do this because once you get to the top and outside the view is breathtaking. It is also quite wide at the very top so no need to worry about being on the edge or anything like that. There are basically 2 levels and you could stop after the first but I recommend you go all the way. The Duomo is quite beautiful and if you are in Florence you really should experience it. Our guide was great. Highly recommend. Highly recommend this wonderful tour. Views were just amazing. This was an excellent tour. The outside of this building is amazing--much more so than the inside, but what is truly unbelievable is the interior of the dome, which you can study from up close. As you ascend the steps, you will get the opportunity to see it from different vantage points. You will also get to view the terrace, which is stunning. But then when you climb to the very top, the view of Florence is a masterpiece in itself. What amazed me was how each of the stairways were built, so many years ago. How did they do this without the aid of modern equipment and do it so perfectly? Do not miss this tour-- it is well worth the climb. very competent guide, truly skip the lines, no waiting, amazing views from the terraces and the dome's top, great experience. highly recommended. Francesca was a wonderful guide. She was friendly and very knowledgable. I highly recommend this tour. The stairs aren't THAT bad because you don't have to do all of them at once. The views are breathtaking! This tour exceeded our expectations! Our guide, Francesca, was knowledgeable, warm, organized and capable. Our group met at 12:15 and were quickly ushered in to a side-door, skipping the huge lines outside. 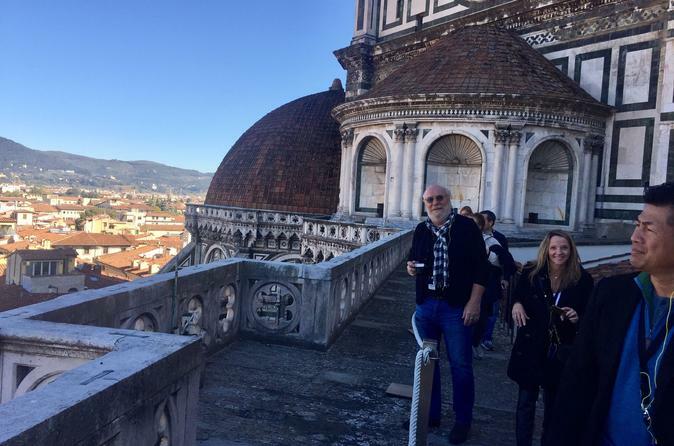 Her love of the Duomo was obvious as she shared fascinating details with us, as she led us up to the terraces that circle the inside of the Dome and we looked down upon the basilica. It was incredible. Then we set off to climb to the top of the Dome. The stairs are narrow and confining but there are repeated openings in the wall that lessen the claustrophobic effect. It was while climbing the stairs that Francesca really shone. She managed our group so that we were able to pass slower moving groups and she efficiently handled any traffic jams. She was very much in charge and confidently led us to the top where again, she navigated the other groups of tourists. 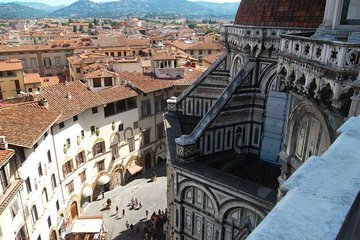 In addition to the info about the Duomo, Francesca provided great tips about where else to visit and eat while in Florence. She stayed with us well over the 2-hour mark sharing her vast knowledge. Those who needed to leave were able to do so. If you do this tour, try to get Francesca! I loved this tour. It was a small group tour and our guide Ricardo was awesome! I was a bit worried when I read the other reviews because of tight spaces and the height, but everyone in our group did fine. It was amazing to climb to the top of the Duomo and our guide Ricardo was very personable, friendly and knowledgeable. AMAZING tour! Views from the top are breathtaking, highly recommended, worth every step ! The views are breathtaking. Totally worth it and our guide was unbelievably knowledgeable. She knew so much history and truly enjoyed what she was doing. It was such a pleasure to share in her enthusiasm for the history of her beautiful city. Wonderful experience and highly recommended. Knowledgeable guide and sense of humour; very memorable. Drawback is we departed duomo and had to re-enter to view crypt and main floor on our own.